About the reviewer: Dr Leon Hunt is a Senior Lecturer in Film and TV Studies at Brunel University. His teaching and research interests include Hong Kong cinema, popular East Asian cinema, Cult Film and TV, Horror, TV Comedy and British Film and Television. He has published widely in these areas, with such publications including British Low Culture: From Safari Suits to Sexploitation (Routledge, 1998) and Kung Fu Cult Masters: from Bruce Lee to Crouching Tiger (London: Wallflower Press, 2003). For non-Spanish speakers, any familiarity with the Spanish gothic is most likely to have come via the cinema, whether in the form of the lurid ‘fantaterror’ of the 60s and 70s (now an object of cult appreciation) or recent international successes such as The Others (2001) and [REC] (2007). Alternatively, they might have read some of the translated novels of Carlos Ruiz Zafón, like his internationally acclaimed The Shadow of the Wind. By extending his study of the Spanish gothic to literature (which accounts for roughly two thirds of the book), Xavier Reyes’ book tells a story a good deal of which will be unfamiliar to many Anglophone readers (this reviewer included). The 1780s are his starting point, when translated editions of gothic works arrived in Spain, initiating the long process of the form being adapted to the local context, not without some considerable obstacles to overcome (religious censorship, an antipathy towards non-realist writing) and more to follow in the following centuries (Francoist fascism). And he brings the Spanish gothic up to date with both the emergence of genre specialists in popular fiction and the Spanish horror film. Reyes acknowledges that putting the words ‘Spanish’ and ‘gothic’ together raises some issues, not least a longstanding resistance to the gothic as a generic category in Spain. There is also the question of the gothic’s relationship to the horror genre, given that the two terms are often used interchangeably. Reyes sees Horror as a genre, albeit one ‘not tied down to specific generic markers like setting, characters and time periods’, while the gothic is best seen as a mode that ‘relies on aesthetics, recurring motifs and iconography’ that are not confined to the horror genre. 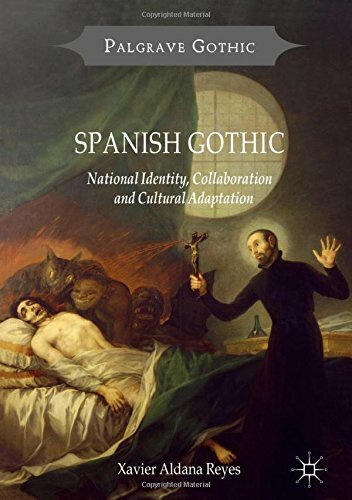 One might debate these definitions - and spend even longer arguing over how to apply them - but the book provides a compelling account of how the gothic was able to pervade (or infect) a variety of genres and modes in Spain during this period. He characterises the gothic as transhistorical, transmedial and transgeneric, materialising in romantic literature, didactic fiction (of both Catholic and anticlerical types), and cinema. Another key theme is that of cultural adaptation, the gothic arriving as something foreign (and, for some, even antithetical) to Spanish culture, but developed in nationally specific ways. After an introductory overview, the book is divided into four sections. The first deals with ‘First Wave Gothic’, more specifically how an imported form began to be absorbed into Spanish writing. Gothic elements initially appear only sporadically, even in the splendidly titled Funereal Gallery of Spectres and Bloody Shadows (1831). Early gothic novels seem to fall into two types - the ‘supernatural explained’ adopted from Ann Radcliffe’s English Gothic novels, a mode that ultimately discourages superstition by providing a rational explanation that dispels fear, and the ‘anticlerical gothic’ that had to be written in exile, focusing on the horrors of the Inquisition and themes of religious corruption. The second section moves from the manifestation of the gothic in romantic literature to the emergence of the gothic short story at the turn of the century, often influenced by the work of Edgar Allan Poe and E.T.A. Hoffmann but with some preoccupations of their own, too. Section three moves into the twentieth century, from a cycle of writing shaped by the contemporaneous ‘spiritualist craze’ to fiction produced under the strict censorship of the Franco regime. The gothic then proliferates in the post-millennial era, producing a generation of writers specialising in gothic horror and responding to and adapting international trends in horror and gothic fiction (zombie apocalypse narratives, for example). The final section examines arguably the most globally accessible form of Spanish gothic: cinema. Reyes includes silent ‘trick’ films and literary adaptations such as The Tower of the Seven Hunchbacks (1944), but the bulk of Spain’s cinematic gothic came in two waves. The ‘Golden Age’ of ‘fantaterror’ of the 60s and 70s took the form of co-productions, often downplaying ‘Spanishness’ in favour of a more international look, low budgets, exploitative material and the practice of ‘double versions’ (a tamer one to get past Franco-era censors and a stronger one for export). The question of cultural adaptation comes into play here again, with visibly international movie referents (Universal and Hammer horror, the Italian giallo) and a proclivity for non-Spanish settings. Reyes characterises the popular Blind Dead series, in which the Knights Templar return as predatory undead ghouls, as ‘the closest thing to a genuinely original Gothic text Spanish cinema produced during its boom phase.’ Nevertheless, he seems ambivalent about much of the fantaterror boom, liberating and regressive at the same time, with a fondness for gore and titillation. There is a marked preference for the ‘subtle, sober, expensive gothic’ of the second major cycle, produced by a fresh generation of filmmakers including Alejandro Amenábar, Álex de la Iglesia and the Spanish-language films of Guillermo Del Toro. The latter - The Devil's Backbone (2001) and Pan's Labyrinth (2016) - are contextualised within the ‘memory boom’ of the 1990s, a period of cultural engagement with memories of the Spanish Civil War. The final chapters focusing on gothic cinema might prove the strongest attraction to Reyes’ book, and it complements the purely filmic focus of Antonio Lázarro-Reboll’s 2012 book Spanish Horror Film. But in giving us the most complete account to date (in English, at least) of this mode in Spain, Spanish Gothic also illustrates the transnational nature of the Gothic as it travelled beyond its original ‘homes’. One might finally wonder: what other non-Anglo-American ‘national Gothics’ might be mapped in this level of historical and textual detail?